It arrived in my inbox one morning and I easily and cheaply could make it for dinner the same day. It’s healthy and adaptable to whatever you have around. 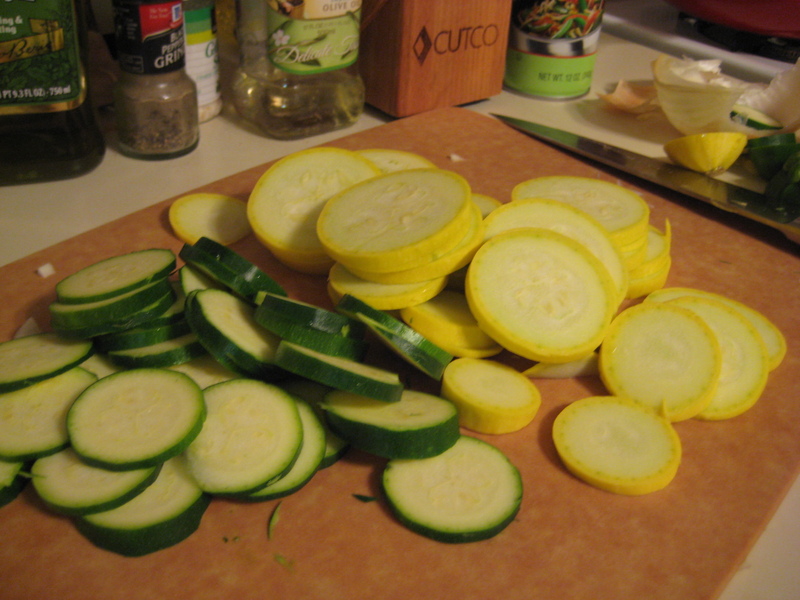 You can whip it together in 15 minutes once you’ve chopped and gathered all the ingredients. It makes me feel smarter than Cameron Diaz. According to Self magazine, this is her favorite dish, a breakfast classic she makes before surfing. But the serving sizes in the original recipe don’t really make sense, and neither do the directions. (Once you cook chicken and veggies in oil, there’s no way there’s enough liquid left to make a roux.) Also, some of the comments on the blog warned about there being too much broth in the recipe, so I only added about a tablespoon and suggest skipping it all together. Here is my twist on this recipe, which I just had seconds of because it was so good. I might actually eat it for breakfast, too! This is a recipe that cooks quickly, so you’ll want to get everything ready at once. Otherwise, you’ll be like me, turning the stove off halfway through so you can get out more ingredients. Sprinkle chicken and veggie with salt, garlic powder, and pepper. 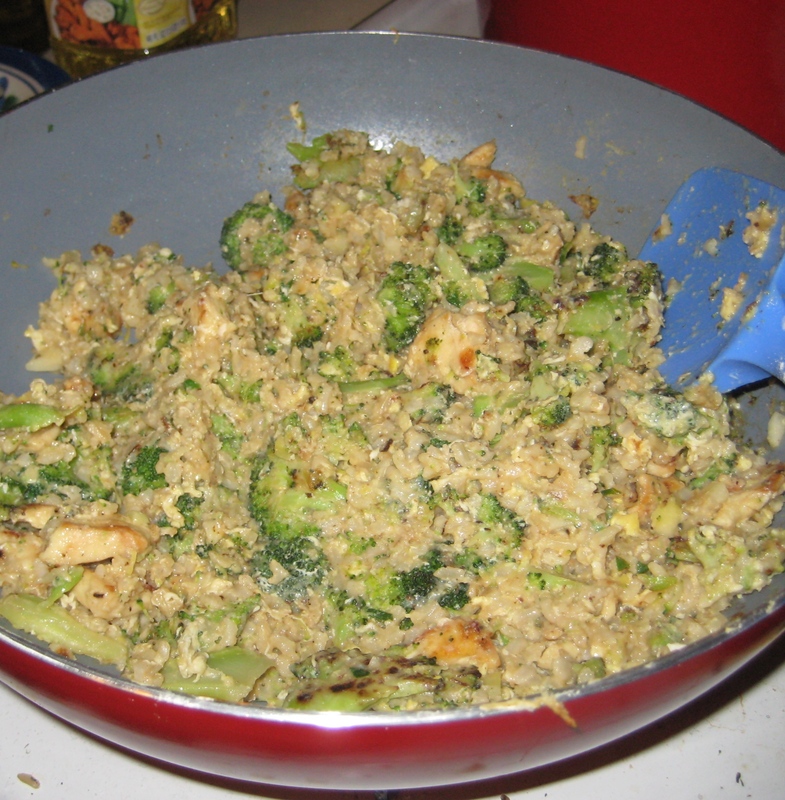 Add chicken and broccoli to a skillet with some oil, and cook until chicken is lightly browned and your vegetable is wilted. Add flour and cook, stirring continuously, for 1 minute. Add rice, garlic, and lemon zest to the pan. Cook 2-3 minutes. Add eggs and mix well until the egg is integrated and well cooked. Add lemon juice and basil (or other spices, if you so wish). Cook until the liquid is absorbed and the rice is slightly brown and crispy. And that’s that! I really like the idea of this dish, like a healthy version of fried rice. I’d like to try it with some cheese mixed in and maybe some peppers next time. I am not a big fan of Italian food because I’m not crazy about tomato sauce, so risotto stands out as a shining beacon of pasta goodness. I often order this at restaurants (heck, last Restaurant Week I had two courses of risotto at Locke Ober) but have never made it myself. I spent my Sunday night whipping up an inaugural batch of risotto in my new bright red cast iron pot, and the result was spot on. It really tried my patience since I generally turn up the heat and get my food cooked asap, but taking my time to stir and simmer was more fun than I expected. This recipe, which I got in my email a few months ago served as the basis of my risotto, but then I changed absolutely everything since I a) already had asparagus a few days ago and b) I don’t eat shrimp. Also, c) I love any and every excuse to eat goat cheese. This dish is great with a simple salmon on the side. Before you start making the pasta, marinade salmon (1/4 lb per person) with lemon juice and dill. About 13-15 mins before the risostto is done, pop in the oven at 375 degrees and cook until flaky.